The Roomba E5 is one of the newest robots from iRobot.com. It’s one of the most advanced robot vacuums we’ve tested to date. But how did it perform on our cleaning tests? Let’s find out! 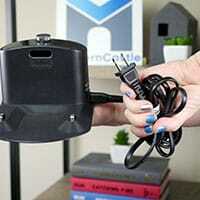 Has WiFi connectivity, allowing users to control the vacuum from their phone or compatible voice device. Offers a powerful cleaning performance and a mix of neat features. Does not have an onboard camera that is used to map out your home. The e5 does not have the ability to recharge and resume. After the battery is dead, the vacuum will charge and remain on the base. The Roomba e5 carries a similar design to all Roomba robot vacuums. This model is built in a fashion similar to the Roomba 890, but does seem to be an upgrade overall. As you first take a look at the top of the Roomba e5 robot vacuum, your eyes gravitate towards three buttons. All three of these buttons are located in the center of the vacuum. The main button is the “CLEAN” button, which acts as both a power button and an automated cleaning button. The buttons on the left and right are the home and spot clean buttons. Home button – By pressing this button, the e5 will return back to its home base and begin to charge. Spot clean – The spot clean button places the Roomba in spot clean mode, as the name suggests. This means the Roomba e5 will travel in small circles over a particular space until it feels it has completed the cleaning cycle. Once you turn the vacuum over, the bottom of the e5 is virtually identical to the new Roomba i7+. The only difference is the Roomba e5 does not contain an automated suction vent but the i7+ does. There are still two rubber brushrolls, three wheels, a spinning brush, dustbin, and battery. As noted above, the e5 does not have an automated suction slot. The new Roomba i7+ robot vacuum has the ability to drive onto its charging base and empty its dustbin, hence the need for the vent. On the other hand, the Roomba e5 utilizes a charging base similar to most other Roomba vacuums, therefore, there is no need for the vent on this robot vacuum. RELATED – Want to see what else Roomba has to offer? Check out their robot vacuums here. With regard to the size of the Roomba e5, not much has changed. Roomba seems to stick closely to a particular shape and size. When compared to previous Roomba models and most other robot vacuums, this size is within the norm. CHARGING BASE | The Roomba e5 includes a standard charging base. Like all Roomba vacuums, when its battery gets low it will try to find the charging base and start charging itself automatically. VIRTUAL WALL | A dual-mode virtual wall barrier is also included with the e5. This wall barrier helps to block the Roomba off from certain areas of your home by creating invisible linear and radial lines. The linear line extends up to 10′ ling while the radial line reaches 4′ in diameter. The Roomba e5 does not offer a ton of features, but there are a few that will be of use to most users. Scheduling the Roomba e5 robot vacuum is one of the neatest features. Let’s say you’re an extremely busy person who just doesn’t have time to deal with the robot vacuum at all. No problem. The e5 has your back. With this robot vacuum, users can set a daily / weekly schedule, in addition to a one-time schedule. Daily / weekly scheduling – This method of scheduling literally means you have the option of scheduling your Roomba e5 to vacuum your home at a specific time, every day of the week. Whether you are there or not, the Roomba will automatically take off to complete its cleaning cycle without you lifting a finger. One-time scheduling – Unlike the daily / weekly scheduling, a one-time schedule is for when you need to have your floors vacuumed on a specific day and don’t want to forget. For example, you may have company coming over, therefore you set a one time schedule a week in advance in order to have the Roomba remember to vacuum your floors before your guests arrive. Users do have the option of using the iRobot smartphone app as well. The app gives users the ability to set a schedule, send the e5 off on a one time clean, put it in spot cleaning mode, or send it back to its home charging base. The cleaning performance we saw from the Roomba e5 was extremely impressive. This robot vacuum was able to plow through all four of our debris types, on all three flooring types with ease. The hardwood floor tests were no match for the Roomba e5. 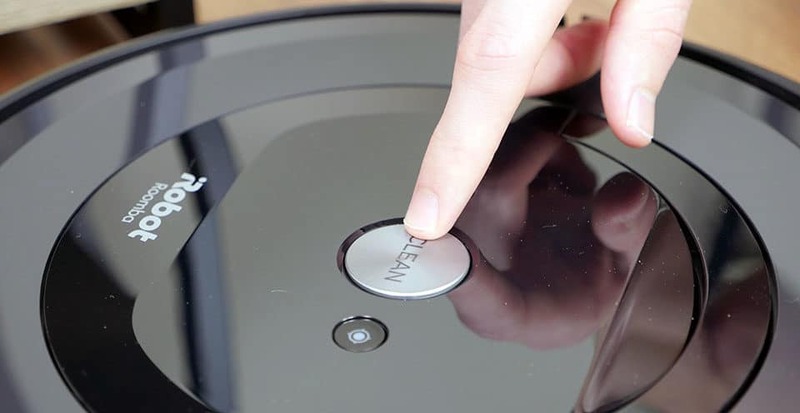 This robot vacuum was able to dominate all four debris types with a score of 100%. Although we do believe the e5 is the replacement for the 890, which seems to be getting phased out of iRobot’s Roomba line, the e5’s performance was shockingly better than the 890. This may be largely in part due to the newer, more advanced brushrolls used in the e5. Additionally, the Roomba e5 was able to clean up each debris quite quickly. Although there was no method to the madness, the vacuum moved swiftly and cleaned efficiently. Performance on low pile carpet was almost identical to the hardwood floor. So there were no issues on the low pile carpet? The only debris that did not score a perfect 100% was the sugar. That said, the sugar was cleaned up to a level of 99%. While the sugar may not have hit the perfect 100% cleaned up mark, the remaining 1% was not visible to the eye. After running the test over the carpet one more time, the 1% of remaining sugar was no longer an issue. Last but not least, the high pile carpet tests. Much to our surprise, the Roomba e5 dominated the high pile carpet tests. Once again, sugar was the only debris that was not cleaned up to a level of 100%. Yet, it did hit 98%, which is virtually flawless, in our eyes. The Roomba e5 is one of the most impressive robot vacuums we have tested to date, with regard to cleaning performance. It is an absolute workhorse and was able to tackle the Modern Castle cleaning tests without blinking an eye….or losing a spinning brush! The best sugar cleaning performance we’ve seen in a robot vacuum comes from iRobot’s Roomba i7+. See our performance tests here, or check out more of the best vacuums for carpets here. While using a robot vacuum may sound complicated, most are not. The Roomba e5 certainly falls under the category of being easy to understand and use. There are no complicated processes involved in using this robot vacuum. Simply press clean and let it run or download the iRobot app and do all of the not so hard work from your phone. As crazy as it sounds, there is basically no set up required with the Roomba e5. Simply unbox everything, plug in the charging base, place the e5 on the charging base, and you’re good to go! The Roomba will charge up and be ready to clean your home in a few hours. As with most Roombas, they come at least 50% charged, right out of the box. Therefore, you could technically put the vacuum to work right away. That said, Roomba does recommend that you charge the vacuum fully before using it for the first time. This method will supply the battery with a strong start, allowing it to run for up to 90 minutes at a time. In addition, you may want to go ahead and run the Roomba e5 for the full 90 minutes after it has reached a full charge. Fully using the battery and then fully re-charging helps break-in the battery, establishing good battery longevity. Next up, press the cleaning button and set the Roomba e5 free. The robot is designed to drive around your home, detect dirt and debris, and vacuum it up. There is not much required out of the user with regard to actually using the Roomba e5 robot vacuum. Keep in mind, you do have the option of using the iRobot smartphone app to control the e5 as well. Setting up the app is painless. It takes just a few minutes to connect to your phone, via wifi, and once it is set up you are able to control every aspect of your Roomba from your phone. The home screen of the app resembles the main user interface of the actual robot vacuum, where there is a large “CLEAN” button housed in the middle of your screen. Once again, you can press this button to send the e5 off on a cleaning mission, or you can select to have the e5 return to its base or do a spot clean. Is the Roomba e5 a Good Value? At half of the price from some of the newer Roomba vacuums, such as the i7 and i7+, the e5 still offers a good number of features, extremely strong cleaning performance, and a long run time. Maintenance is another area where the Roomba also excels. The only maintenance costs required are replacing the high efficiency filter, the spinning brush, rubber brushrolls, and battery. Keep in mind, the filter is really the only piece that needs to be replaced frequently. All other parts are really dependent on the wear and tear of the vacuum. If you’re looking for a quality robot vacuum and don’t want to spend a ton of money, the iRobot Roomba e5 is a great addition to almost any home. Who Should Buy the Roomba e5? If you’re in the market for a well-rounded robot vacuum that strikes a nice balance between excellent feature set / performance and price, the Roomba e5 is a great choice. Want a versatile robot vacuum: The Roomba e5 has the ability to travel between hardwoods, tile, carpets, and rugs with ease because of its powerful wheels. If you have home with several changes in floor material, the e5 could be a nice addition. Want the ability to set a cleaning schedule: If you’re a fan of schedules, this robot vacuum may be a good fit. The e5 can be scheduled daily, weekly, or just one single time. Want strong cleaning performance: This robot vacuum is expected to perform quite well on all indoor floor types. 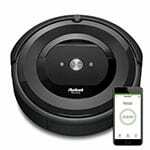 Want a newer, less expensive Roomba robot vacuum: Although this is one of Roomba’s newest additions to their robot vacuum line, it is also one of the less expensive models. The relative performance for the price makes the e5 is a solid value overall. For more information on the Roomba e5 see here. Why did the Roomba e5 robot vacuum score the way it did? Design – Durable body, good size, brushes work well in corners, and rubberized brushrolls all work together beautifully. Not bleeding edge, but better than most others in the market. Performance – Cleaning performance was nearly flawless. This robot vacuum was able to navigate through our cleaning tests with ease. Usability – Intuitive button layout on top is a plus, as is the iRobot app, which is incredibly easy to use and powerful. Value – Not a cheap robot, but not over priced other. Strikes a really nice balance between performance and costs. The Roomba e5 is a robot vacuum loaded with advanced technology, cool features, and a strong cleaning performance. This robot vacuum is a less expensive model than some of Roomba’s newer vacuums, such as their brand new i7 and i7+. With the less expensive model does come fewer bells and whistles, but in the end the Roomba e5 is still one of the most impressive robot vacuums we have seen to date.